Excellent performance and big capacity, but pricey. Superb performance; simple to use; huge capacity. Extremely expensive; 2.5-inch version needs rare connections. Is this the second coming for SSDs? Wipe the slate clean. Forget the SATA interface and forget the AHCI protocol. This is high bandwidth NAND Flash-specific storage of the highest order. This is solid state all grown up and forging its own path. Since the first consumer SSDs hit our PCs, they’ve been piggy-backing highlatency mechanical drive tech in terms of their interfaces and protocols. In the beginning of the SSD revolution, running across the 600MB/s limit of the SATA 6Gb/s interface wasn’t much of a problem. But quickly our SSDs became more trustworthy and more capable, and suddenly they were bumping their heads against the limits. Along came PCIe-based drives, but they were mostly still smaller SATA drives connected to a PCIe RAID controller. Then came actual PCIe interfaces specifically designed for SSDs. The new wave of Flash storage had begun. The M.2 socket and the still mostly unused SATA Express arrived with the Z97 and X99 chipsets. But breaking clear of the bandwidth limitations of the SATA interface is only one strand in unlocking the true potential of solid-state storage. The other is all about getting around the legacy setup. The AHCI protocol was introduced when SSDs were a mere twinkle in an old USB stick’s eye, and has been almost inextricably linked to high latency spinning platters. That setup still works fine for mechanical drives, but the legacy commands in AHCI still have to be run through, even when an SSD is in place. The drive then has to go through each legacy command, even if they have no relevance to high-speed SSDs. That wastes an awful lot of CPU cycles. 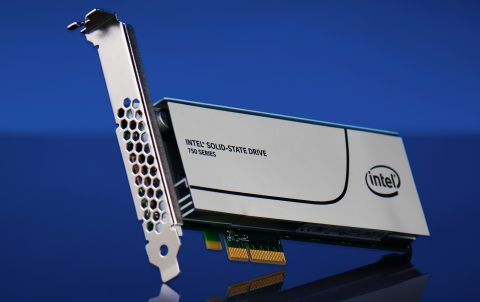 When Intel introduced its enterprise level DC P3700 NVMe drives, it used the Linux AHCI stack as an example of the wasted time and power that goes into running an SSD across the legacy protocol. Using a quad-core i5, the Linux stack runs to 27,000 CPU cycles, meaning it needs a full 10 Sandy Bridge-level cores to drive one million IOPS (input/ouput operations per second). With the streamlined NVMe Linux stack, that’s cut by around a third, needing only 10,000 CPU cycles to reach the magic million figure. That enterprise drive is important, not just for providing an example of how powerful the NVMe protocol can be. It also forms the basis of this first consumer NVMe drive. The bespoke controller at the heart of the P3700 is the same 18-channel controller as the one that makes the SSD 750 so speedy. That controller is kept honest with a hefty 2GB of DDR3 cache on this 1.2TB version. There are some interesting scores when we get to the 4K random read/write performance. At 38MB/s, the 4K random read speed isn’t amazing, but the write performance of 200MB/s is stunning, nearly twice as quick as the closest competing drive. Compare all that with the fastest PCIe drive we’ve previously tested, the Samsung XP941, and you can see where the AHCI protocol is holding things back. Its 4K write performance is a quarter of what the SSD 750 can achieve. There we have it then. The 750 is the fastest SSD we’ve ever tested, and by a comfortable margin. But it’s also one of the most expensive. The problem with being a brand new technology, and being first to market, is that it will always command a high price tag. That’s especially true given there’s still no NVMe competition. Couple that with the fact it’s Intel, and prices were always going to be sky-high. This is like the Extreme Edition CPU of solid-state drives. But there’s a certain justification. Intel has had to invest heavily in the ecosystem of NVMe, working to ensure all mobo makers are able to get BIOS support for their Z97 and X99 boards. The SSD makers who will follow up with inevitably cheaper NVMebased SSDs won’t have that R&D cost. There’s a little bit of the Titan X about the SSD 750. It shares the basic core silicon with its pro-class brethren, the P3700, so it’s got similar levels of performance. But the 1.6TB enterprise drive is well over $5,000, while this high-capacity, high performance drive is just $1,030. Looking at the cost per GB makes it look less extortionate. When Intel released the X-25M, the first real performance SSD (for all its subsequent faults), it cost $3.72 per GB. This 1.2TB drive delivers a far lower 86c/GB. And prices will tumble. This is the birth of NVMe. The ecosystem is there now, so you can bet NVMe-based SSDs will be appearing from everyone by the end of the year. It’ll go crazy once Marvell and SandForce’s controllers are out there. June’s Computex is likely to be built upon a sea of NVMe drives. Plus, we doubt this is as fast as an NVMe drive can go. The 750 sure looks lightning-fast, but we’ll know more once competing NVMe controllers are out in the wild. For now though, this is as quick as it gets. Best scores are bolded. Our testing platform is a stock-clocked Intel Core i7-4770K on an Asus ROG Maximus VII Hero Z97 motherboard with 8GB Corsair Dominator DDR3 at 1,600MHz.